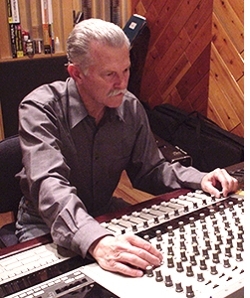 Jim Waller has been in the music business for over forty years as an arranger, composer, producer, performer, and recording engineer. He is the Coordinator of Music Industry Studies, and the Director of the University of the Incarnate Word Jazz Ensemble. In 2009, the UIW Jazz Ensemble performed at the Montreux Jazz Festival in Switzerland and was the only university jazz ensemble from the U.S. invited to perform at the North Sea Jazz Festival in Rotterdam, Holland. Jim teaches Music Industry Studies I & II, Introduction to Music Technology, Studio Arranging, Record Production, Web Design For Music Applications, Electronic Music Composition, Jazz Improvisation, and Film Scoring. Jim studied music composition with Mildred Couper, Thea Musgrave, Edward Applebaum, orchestration with Gordon Crosse, Ken Metz, and jazz arranging with Billy Byers. As a composer, he has had 60 plus compositions in various genres published by Acuff-Rose, Doral Music, EMI Music Publishing, Anthony Music Corporation, The Production Garden, and Southern Music. Three of his recently published compositions/arrangements for jazz ensemble won two ASCAPLUS awards and were performed at the Montreux Jazz Festival in 2009. As an artist/producer, Jim has had recordings released on Warner Brothers, United Artists, Del-Fi, Arvee, Sundazed, and CBS-Columbia Records. Jim was a member of 'Los Blues', a groundbreaking jazz-rock octet that once held the record for the longest steady engagement (300 weeks) in a Las Vegas lounge (The Casbar Theater in The Sahara Hotel, where they shared the stage with Don Rickles, Duke Ellington, The Four Freshmen, Norm Crosby, and Sammy Davis, Jr.) During his residency in Nevada (1967-1973) Jim played lead trombone with the UNLV jazz ensemble, was Musical Director for the â€œMiss International Showgirlâ€ television special broadcast live from the Dunes Hotel, and arranged and produced part of the soundtrack for the foreign-produced film 'This Is Las Vegas' in which 'Los Blues' made several appearances performing selections from their newly recorded 'Los Blues - Volume One' LP on United Artists Records. In addition to the Sahara Hotel, 'Los Blues' performed at the 1971 Crater Festival in Honolulu, The Fiesta Palace Hotel in Mexico City, Madison Square Garden and the Waldorf Astoria Hotel in New York, Small's Paradise in Harlem, and Oil Can Harry's in Vancouver, B.C. Jim has performed with Marvin Gaye, Etta James, Willie Nelson, Tony Orlando and Dawn, Cat Anderson, Bobby Hatfield, Ray Peterson, The Ojays, Gene Pitney, Richie Cole, Jackie King, Paul Gonsalves, Pete Fountain, The Coasters, Frank Rosolino, and with opening acts for Curtis Mayfield, Blood Sweat and Tears, Isaac Hayes, Helen Reddy, The Beach Boys, Tower of Power, The Drifters, O.C. Smith, and Jackie DeShannon. Mr. Waller holds an MS in Music Technology from Indiana University-Purdue University, Indianapolis (IUPUI) and a BA in Music Composition from the College of Creative Studies, University of California, Santa Barbara (UCSB). While finishing his undergraduate degree at UCSB, he taught jazz arranging and composition at Santa Barbara Community College (SBCC) and directed the SBCC Jazz Ensemble and the SBCC Continuing Education Jazz Ensemble. He is a voting member of the National Academy of Recording Arts and Sciences (NARAS), a member of the American Society of Composers, Authors and Publishers (ASCAP), the Music and Entertainment Industry Educators Association (MEIEA), the American Federation of Musicians (AFM), the International Webmasters Association (IWA), and the HTML Writers Guild. He was on the Advisory Board, Fox Tech School of Internet Design (2002-2004) and is a member of the St. Phillips Web Developer Advisory Committee (2008 - present).